Shane Black’s return to the Predator franchise is gratuitous in every glorious sense of the word. The veteran writer-director amps up the humor, bloodshed, and absurdity for The Predator, which feels only fitting for a creature borne from the cradle of ‘80s excess. 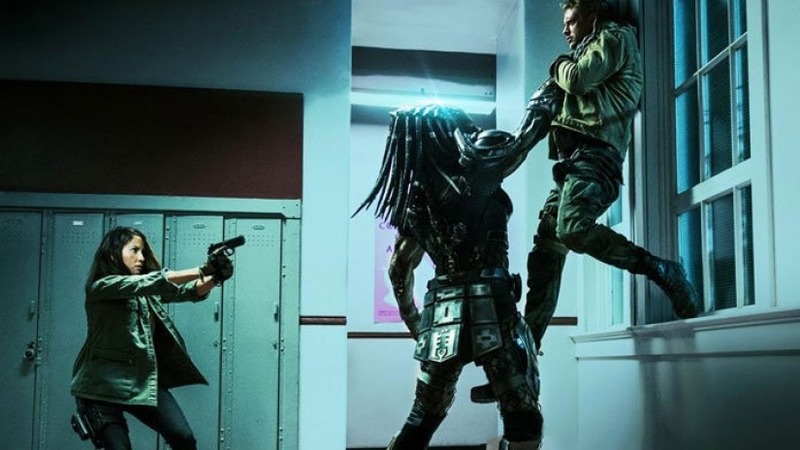 It remains respectful of the 1987 classic, Predator, and the not-so-classic 1990 sequel, Predator 2, while still forging its own irreverent identity. The Predator is a romantic throwback to films oozing with machismo, whose primary currency trafficked in gallows humor and dripping viscera. This isn’t to say The Predator is perfect. It’s riddled with wounds, most of them self-inflicted. From its charisma-challenged hero to its unrelenting darkness (literally) and choppy editing, Black’s cartoon of carnage frustrates and entertains in almost equal measure. Still, if you’re a fan of ‘80s action films, it’s inconceivable that The Predator will leave you cold. The story is a familiar one; deadly alien Predator crashes in the jungle and unleashes all manner of holy hell upon humanity. Our hero, Army Ranger sniper Quinn McKenna (Boyd Holbrook), is surveilling a secret prisoner exchange when the Predator’s disabled spaceship sputters into the tropical canopy above him. All we know about his soldiering prowess comes courtesy of his estranged wife (Yvonne Aguilera), who rattles off his accomplishments like some macabre grocery list. Basically, he’s assassinated a lot of people and gotten medals for it. The opportunistic Quinn loots some of the scattered Predator tech after the crash, including an iconic Predator facemask and a wrist gauntlet armed with more gadgets than James Bond. Fearing no one will believe his story (particularly since the Predator murders all of the potential witnesses in his Ranger crew), Quinn ships the contraband back home. These artifacts end up in the hands of his autistic son Rory (Jacob Tremblay), who just happens to be a savant with hi-tech gizmos. It’s the type of gear that comes in handy for a terrorized little boy, who tames a group of bullies by using his newfound toys to comically explode an entire house. These are the moments when The Predator really shines. Black is a master of the unexpected, and while this film lacks any audacious surprises (such as the controversial ‘Mandarin is a decoy’ twist from Iron Man 3), it’s packed with enough non-sequiturs and clever flashes to keep things interesting. Who would have guessed, for instance, that Predators have alien space doggies and they’re totally adorable? The Predator is a brutally good time! Once Rory activates the Predator gear, the plot kicks into overdrive, with Quinn racing to save his son from the murderous space alien that wants his stuff back. Along the way, Quinn runs into “The Loonies”; a band of disgraced soldiers suffering from a menagerie of mental issues. They’re sort of like the gang from One Flew Over the Cuckoo’s Nest, only much more likely to ditch group therapy in favor of murdering Nurse Ratched. If The Predator has an obvious upgrade to its classic 1987 predecessor, it’s Black’s knack for using humor to create memorable secondary characters. The Loonies certainly offer echoes of the first crew from Predator (which included a baby-faced Shane Black), but they feel like real people who just happen to be crazy soldiers. You can easily imagine having a beer with these misfits, compared to the decidedly awkward proposition of dining with Jesse Ventura. If Ventura ain’t got time to bleed, he probably ain’t got time for dessert, either. Trevante Rhodes (as ‘Gaylord “Nebraska” Williams’) meshes nicely as Quinn’s primary confidante, while Keegan-Michael Key assumes the role of a foulmouthed wiseacre, Coyle. Coyle loves tormenting his buddy Baxley (Thomas Jane) about his mother’s sexual prowess and anatomical peculiarities (her privates are “Rated ‘E’ for Everyone”). It feels like these characters not only know each other but have a healthy love/hate relationship from years of squabbling. This raises the stakes when things get physical, and do things ever get physical! When the Predator unloads on his enemies, he becomes a blur of brutal violence. His Krueger-esque razor claws eviscerate flesh and sever limbs like a demented Iron Chef. 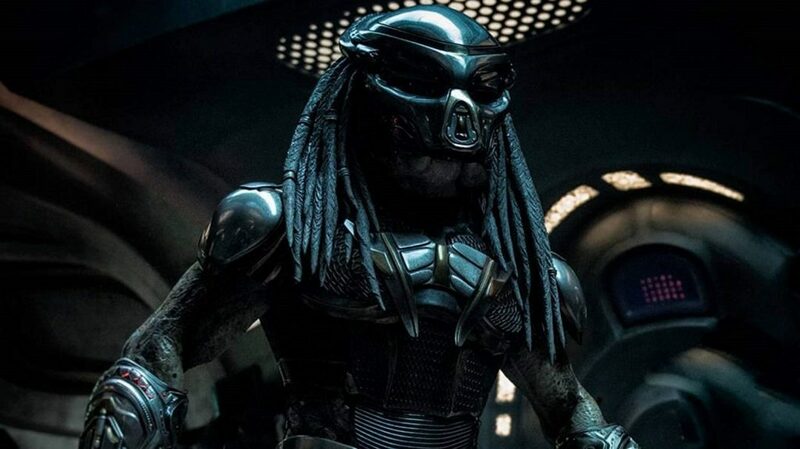 Most of his weaponry (shoulder cannons, invisibility cloak, etc) remains similar to previous installments of the franchise, so Black wisely focuses on the Predator’s expertise in hand-to-hand combat. This results in the film’s gorier effects, including plenty of intestines making guest appearances outside of bodies. Unfortunately, much of the action is obscured by darkness and breakneck editing. All of the action sequences take place at night. Whether to mask some sketchy special effects (the Predator is a combination of practical costumes and digitally enhanced facial articulation) or to increase the tension, Black’s decision to shroud everything in darkness diminishes much of the film’s gory delights. Older fans of Predator will be reminded of the simple pleasures that made them love the original. The editing style, too, makes it difficult to understand the physical environment. This is particularly evident in the jungle sequences, where the rapid-fire edits make it impossible to judge where characters are in relation to each other and the Predator. Even character deaths are confusing, leaving you to wonder how exactly that last dude got his head blown off. Worse still is the choice of Holbrook as the lead. 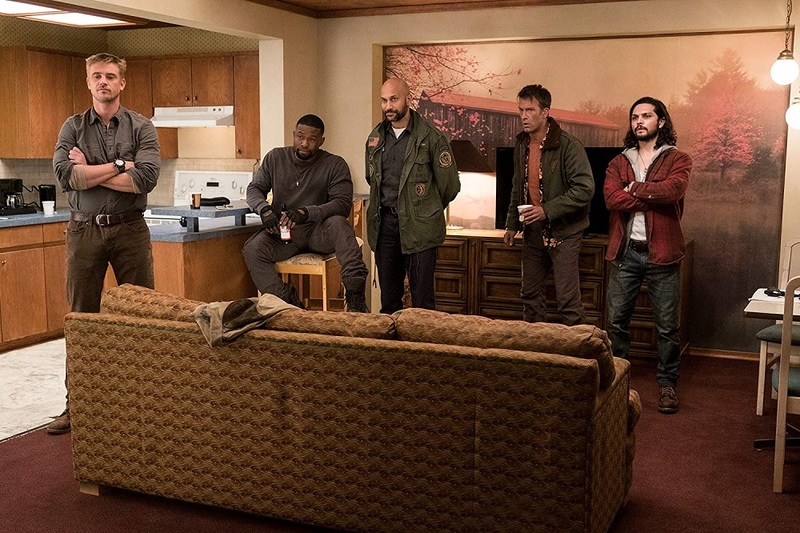 Holbrook has done solid work in the past (including his turn as the baddie in Logan), but he lacks the screen presence to hold our attention and the comic timing to deliver Black’s quips. His shortcomings are ameliorated by The Loonies, but he often fades into the background when sharing a scene with these dynamic characters. The mind boggles at what The Predator might have become had Benicio Del Toro not forfeited the lead role due to scheduling conflicts. Shortcomings aside, The Predator is a brutally good time. Older fans of Predator will be reminded of the simple pleasures that made them love the original, while new fans will enjoy the quirkier modern sensibility that Black delivers. Here’s hoping for future adventures in the jungle.